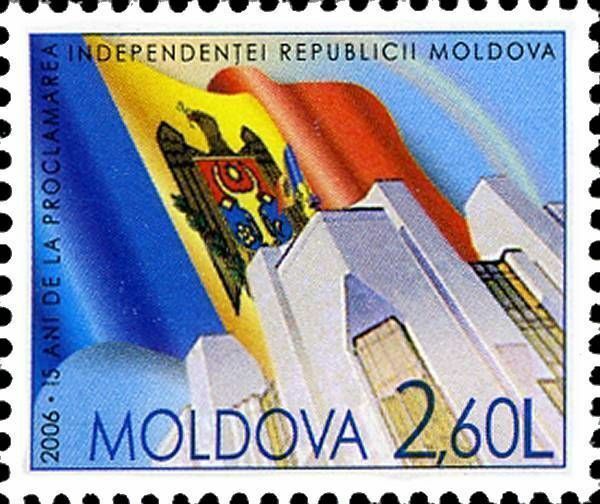 On 27 August 2006, the Post Office of Moldova (Poșta Moldovei) issued a postage stamp with the title 15th Anniversary of the Proclamation of the Republic of Moldova. The issue comprises one stamp, with an associated cancellation (postmark) and first day cover (FDC). The designer was Vitaliu Pogolşa. The printing was performed by Tipografia Centrală, Chişinău. The Declaration of Independence of the Republic of Moldova (Romanian: Declaraţia de independenţă a Republicii Moldova) was a document adopted by the Parliament of the Republic of Moldova following the failure of the August coup attempt. The document claims 'millennial history' and 'uninterrupted statehood' within historic and ethnic borders and refers to the official language as 'Romanian.'. This founding act of the Republic of Moldova from 1991 is celebrated on August 27, the National Day or Independence Day. Read more.. This article uses material from the Wikipedia article 'Moldovan_Declaration_of_Independence', which is released under the Creative Commons Attribution-Share-Alike License 3.0. This article uses material from the Wikipedia article 'Flag_of_Moldova', which is released under the Creative Commons Attribution-Share-Alike License 3.0.